Uglyworld #1050 - New Hangs Outer (Project BIG - Image 103 - 365), originally uploaded by www.bazpics.com. 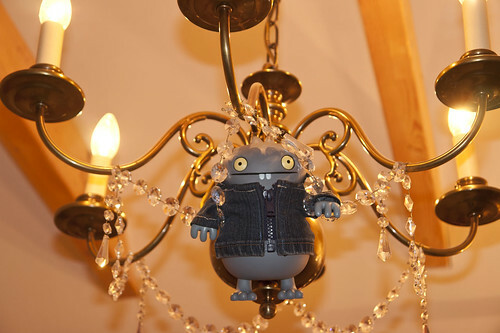 While Baz was workings late tonight I had to finds something to amuser myself and befores long I finded myselfer looking ups at the chandamalier which hangs in the hotels room we has this weeker. It took quite some amounts of climbings and abouts all the balancers I could manages, but finallies I finded myself hanging in the crowns jewels of the chandamalier. I is goings to hangs here in silences until Baz comes home from works and goes to beds, then I will starts to whispers "Baaaaaz" mega quiets and sees how long it takers him to works out where I is, I thinks it will takers quite some times!! !